A feisty woman with daring views finds herself A Schoolteacher in Old Alaska. Hanna Breece’s story languished for over fifty years until a relative brought it to life. A schoolteacher in Old Alaska making waves at the turn of the century sounded like the perfect subject for the next read. Hannah Breece came to Alaska in 1904, assigned by the U.S. Department of Education to establish schools for Native and Russian children. Her timely view throughout her 14 years in the Frontier was that her purpose was to bear educational gifts and benefits from the U.S. government and civilization itself. Jane Jacobs, Hannah’s great-niece, known by her own right as a leading urbanologist, fills in the gaps that Hanna left in her narrative, in A Schoolteacher in Old Alaska. Hannah’s first four years were spent on Afognak Island and Wood Island off Kodiak Island. She had already been a teacher for twenty-four years in Pennsylvania and Rocky Mountain Indian Reservations. This photo shows two Anglo women who are identified as possibly schoolteachers on Wood Island in the time period she was there. The Alaskan island villages in which she worked have relocated and vanished, and the terrain has shifted or they were obliterated by tidal waves resulting from 1964 earthquake. 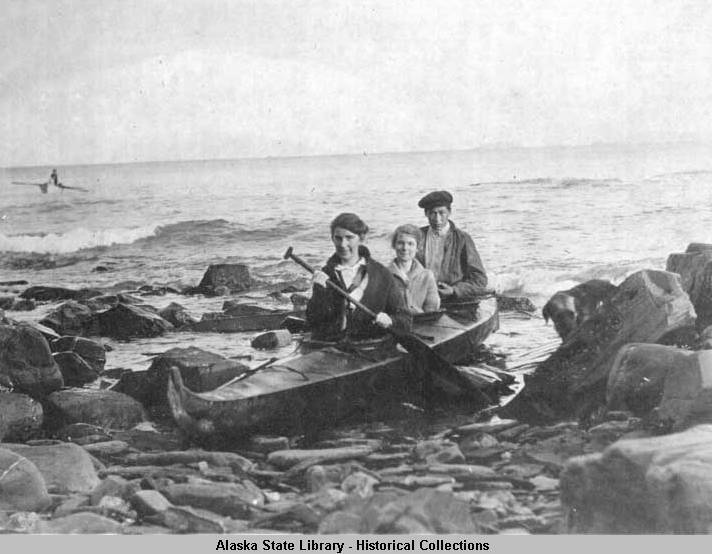 Jacobs retraced her aunt’s sojourn in Alaska and added narrative and context to her aunt’s handwritten memoir. I wondered what would bring a 45 year old spinster to the frontier. While quite conventional and proper, Hannah also held daring views. She was not bound by traditional teaching methods and often improvised when she encountered language barriers and restricted opportunities to be in front of her pupils due to their family commitments and lifestyle. She was generally enthusiastic, religious, loved finery, and was a staunch prohibitionist. Travel was perilous and upon arrival, life was arduous in these villages. Contrasting cultures between Russian and Aleut residents often necessitated ingenious solutions. Hannah was responsible for book learning, but also for educating the populace in modern ways. She often served as an on-site mediator, and also advocated for the people, serving as a conduit to and from the U. S. Department of Interior. Hannah’s preference was to get things up and going, and then, after things were in place, move on to a new remote location. She would typically request reassignment after two or three years. 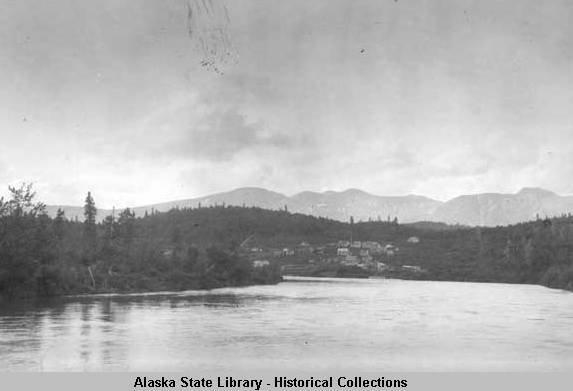 After the Kodiak area assignments, she moved on to the Lake Iliamna area – shown in the photo, and then to Fort Yukon and Wrangell. In a lengthy commentary at the end of the memoir, Jacobs comments and clarifies through a modern lens. Seeking to draw conclusions derived from federal policy as meted out by an increasingly frustrating labyrinth of bureaucratic agencies, Jane bemoans Washington’s micro-managing and ignorance. The system was firmly in place and bucking it was to no avail. More interesting is Jane’s discovery that Hannah may have self-sabotaged her career with her partisan advocacy of Native interests. Much of this advocacy stemmed from benign neglect on the part of Washington. Personnel changes and unfilled positions left many of her requests unanswered. Jane admits that she let Hannah’s fragmented manuscript languish for more than 50 years. Assumptions and attitudes inherent in Hannah’s times conflicted with Jane’s beliefs – she hated them. As time passed, though, Jane came to understand that without the attitudes and beliefs, there would have been no story. Hannah and others like her would never have been sent, nor more than likely would have gone on their own, to Alaska. Hannah eventually retired to Oregon. Jacobs recalls a rare visit to Pennsylvania and was taken along on a visit to a colleague of her aunt’s in an old folks’ rest home. Expecting to be bored, instead the 9-year-old Jane recalls a rollicking afternoon spent with the two old ladies gleefully recalling scandals and hilarious moments. Later, she would be somber thinking of the elderly teacher, confined to one room, waiting on the inevitable in obscurity, highly ironic considering the dangers and adventures that had gone before. The last sentence of the memoir reads, “And I was glad that I had had a small part in blazing the way for better things in this most beautiful, most wonderful land.” Ultimately, Hannah is revealed as generous, stubborn, independent and original. I think I would have liked her very much. I’m going to have to look for this book – it’s my kind of read!